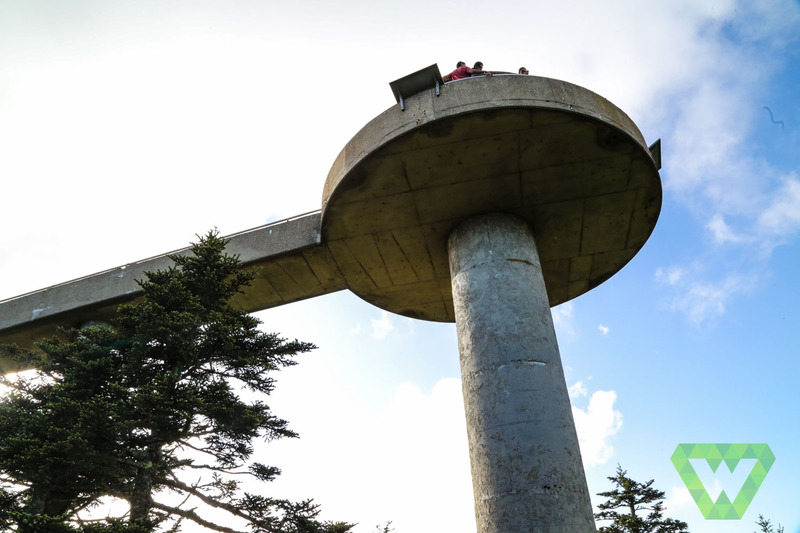 One of my favorite childhood memories is climbing up Clingman’s Dome in the Great Smoky Mountains National Park. I thought the swirly sidewalk was so much fun to run up. Going back as an adult was just as much fun! 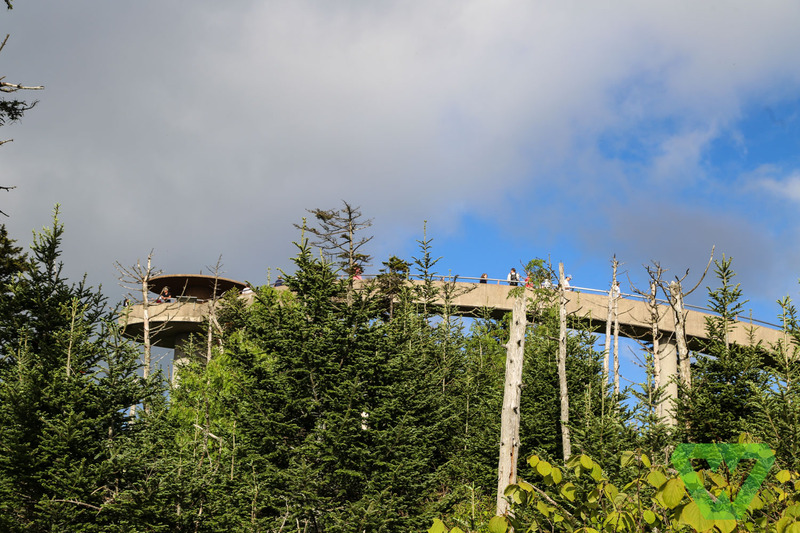 Clingman’s Dome is the highest point in Tennessee. Actually, half of it lies in Tennessee and half of it is in North Carolina. On a clear day, you can see over 100 miles and the view spans seven states. The panoramic view is pretty spectacular. 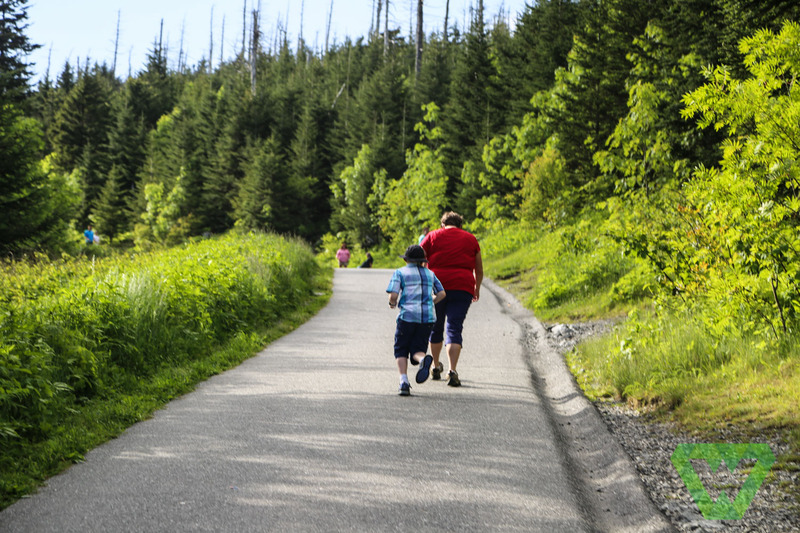 To see that view, there is a steep half-mile walk along a paved trail. 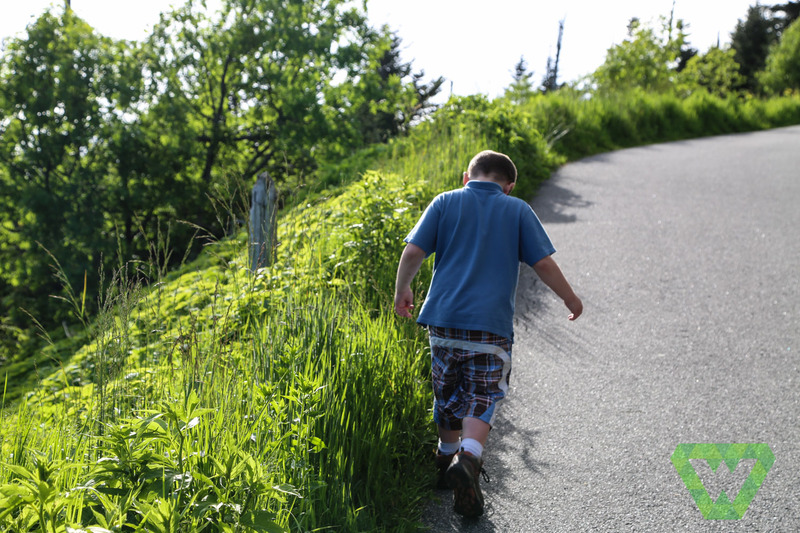 In fact, it’s so steep that they tend to recommend that strollers and wheelchairs be left at the bottom. About every 200 feet, they have benches for resting. If you’re in shape, it could be a piece of cake that could be conquered in about 15 minutes. If you’re not in shape- like me :)- you could easily spend 45 minutes just getting up the hill. We recommend bringing a water bottle. There are bathrooms (vaulted toilets) at the base of the trail near the parking lot. There’s often precipitation, and the temperatures can change quickly, so the national park service suggests bring a jacket- even during the summer. At the top of the trail, just prior to the base of the observation tower, there are trailheads that take you down the Appalachian Trail. 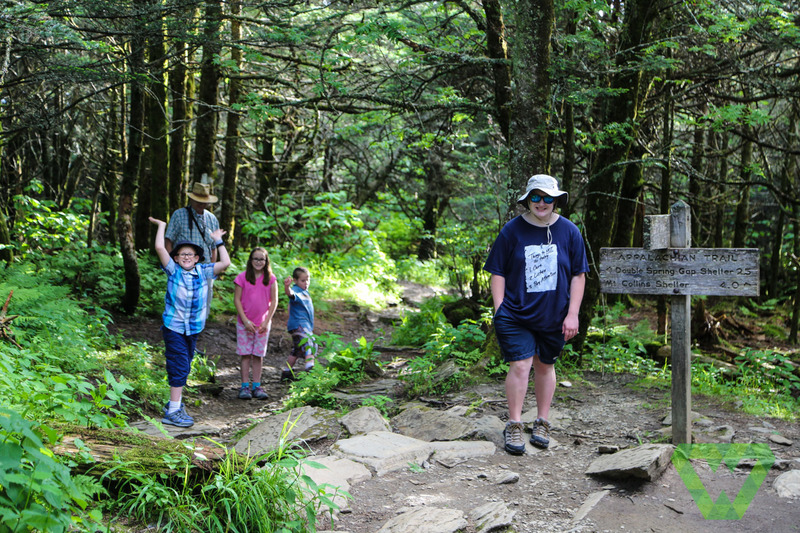 We took the kids down one trail (just a few hundred yards) so they could experience the Appalachian Mountain Range and it’s little hidden treasures. Be careful and mindful of snakes, ticks, and other wildlife. The trail in the higher ridge is prone to get winter-like weather conditions, even in the summer. Pants are not a bad idea if you’re going to walk the trail for awhile. Keep in mind that the paths can be pretty steep, narrow, and even treacherous. At the top of the observation tower, there are benches for resting, “telescopes” for kids to see the panoramic view, and is mostly covered from the sun and weather. This is a popular place to take pictures, so don’t forget your camera! Sunsets are often the highlight of Clingman’s Dome. Professional and amateur photographers often go up to capture this Great Smoky Mountain sunset. 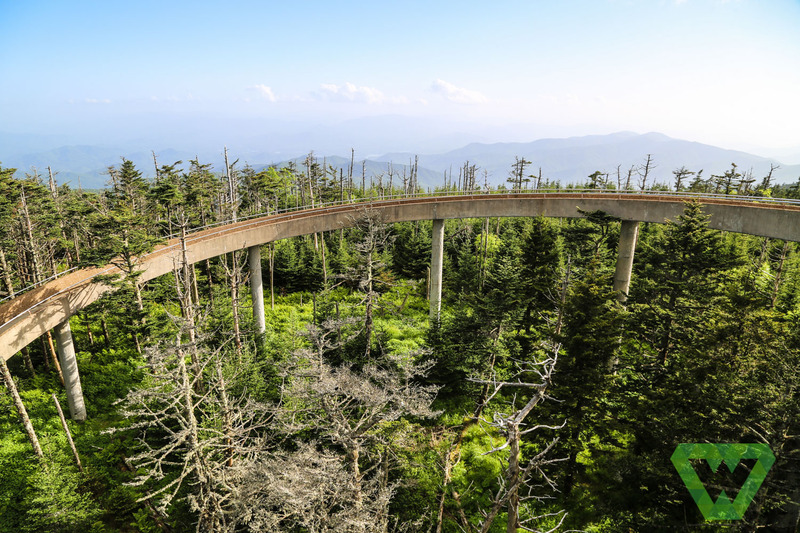 Although the observation point is open all year, the road to get to Clingman’s Dome is closed from December 1 through April 1. They do allow cross-country skiing and hiking along the road during the winter. So, keep that in mind as you prepare your trip to the Great Smoky Mountains. 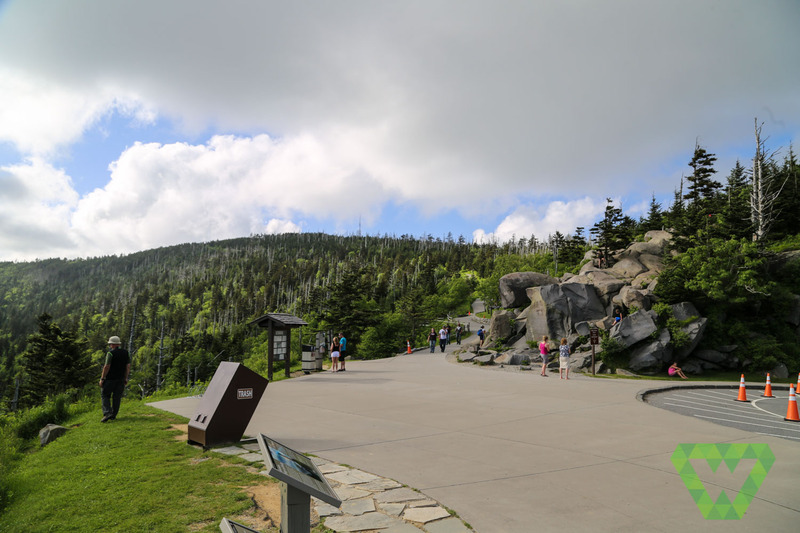 Directions to Clingman’s Dome and other information regarding this amazing observation point can be found at http://www.nps.gov/grsm/planyourvisit/clingmansdome.htm. I hope you find it as amazing as my family did this summer!